After mentioning in a recent post, that my family had enjoyed this pie after dinner a couple of weeks ago, I had a couple of people asking about it. So, here it is, for you to bake and enjoy with your family. You know a recipe is good when it's title has someone's name attached to it. 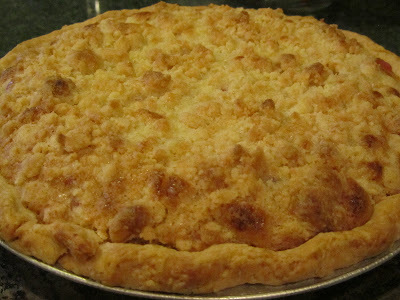 In our family we have a chocolate cake recipe known as Betty Jane's chocolate cake, some yeast-raised crescent rolls known as Nana's dinner rolls, and this recipe, Jayne's rhubarb custard pie. This is a rhubarb pie that has converted a couple of rhubarb haters to "I'll eat this rhubarb pie" people. A year ago spring, I served this pie to friends who were not thrilled with rhubarb to begin with, and a few weeks later, I wound up giving them a rhubarb plant from my garden. The pie was that big of a hit in their house. If your rhubarb is still going strong, give this pie a try. If your rhubarb is fainting from the summer weather, just remember, when your rhubarb makes a comeback, the recipe will be here. Combine flour, sugar and butter. Add just enough water to moisten the crumbs. Sprinkle over pie filling. Bake pie at 400 degrees F (205 C) for 15 minutes. Reduce heat to 350 degrees F (175 C), and bake another 15 minutes, or until top of crust is golden, or crumb topping is light golden and has puffed up a bit. I've been eyeing up some rhubarb in my mother-in-law's garden this week. I shall give this a try (thanks to the metric measurements). Liking the new blog layout! I hope you enjoy the pie! Reminds me -- I should bake another one soon. So what else is doing well in your mother-in-law's garden this summer? The pie's been cooked and eaten already! Yummy! I had to adapt it a bit (well quite a lot actually) due to a lack of flour, but I think it kept its essence and works fine without a bottom crust, with cornflour in the custard, and with an oaty crispy topping instead! And I forgot to say we liked the pie even more because we know a Jayne who is one of the kindest people you could ever hope to meet! I cheated a bit as I found I had some rhubarb here, but I still have my eye on MiL's (who's only 10 minutes up the road) for a second attempt at the pie, maybe with the right ingredients this time. That's the only edible thing in her garden unfortunately! Thank you! I think rhubarb is a nice looking plant. So much so, that I've planted it in with ornamentals in our garden. The pie is good! You're welcome! If you lived next door, I'd give you all you could want! 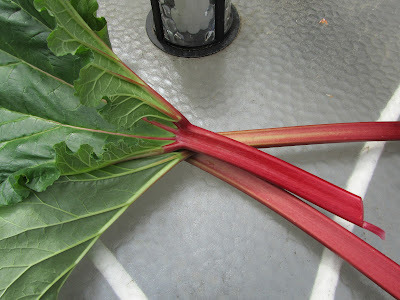 Rhubarb has got to be one of the most prolific fruit/vegetables (technically a vegetable) that I know. I started with 3 small plants 15 years ago, and now have 8 enormous plants, and I've given away 5 more. Good luck finding some rhubarb.